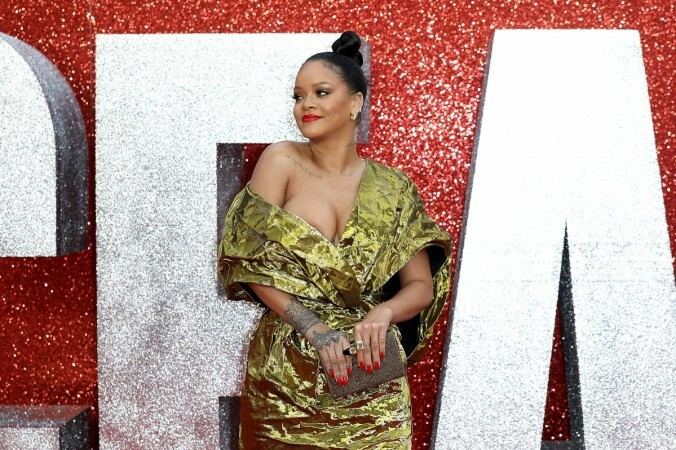 The singer-turned-actress Rihanna had walked the red carpet at the London premiere of Ocean’s 8 dressed in a golden metallic gown and joined actors Sandra Bullock, Cate Blanchett, Mindy Kaling and Helena Bonham Carter among others. She played the role of a tech genius named Nine Ball in the movie Ocean's 8. For the London premiere, she chose to dress in an off-shoulder gown and the shoulder of the dress fell below its position resulting in almost having a nip-slip moment. However, the singer took things under control before things got out of hand, she grabbed the material near her breast and posed for the camera despite the mishap. Apart from the wardrobe malfunction, Rihanna looked perfect for the event as she teamed the eye-catching number with statement red lips and lashings of black mascara. She tied her hair up into a bun, and matched her outfit with a matching clutch.